In the realm of cosplay, few American cartoons enjoy the level of success that The Venture Bros. does. “The Venture Bros. has a strong cult following. It's a real geeky cartoon with a lot of comic book and sci-fi references,” saidMarc Ilagan, founder of VentureBrosBlog.org. "Other TV shows like 'Family Guy' are just not as popular among cosplayers," he said. '"It's nothing against the show, it's just difficult to pull off a character in plain clothing versus an actual fantasy costume. At Dragon*Con, I've seen costumes from shows like 'Metalocalypse', 'Superjail' and 'Harvey Birdman' but not as many as the Venture Brothers. I think the Venture Bros. remains a popular show to cosplay because the characters are fun and costumes relatively easy to make." Dragon*Con, an annual sci-fi fantasy convention in Atlanta, Georgia, is is like a giant costume party, Ilagan said, and "Venture Bros." fans take pride in showing off their costume making skills there. “'Venture Bros.' costumes are insanely popular at Dragon*Con," he said. "Never have I seen so many people dressed as characters from the show at a single event." "The Venture Bros." started as a send up of action/adventure cartoons of the late 60s, quickly morphing into a satirical, yet smitten love song to the genre. It follows the animated antics of two boy-adventurers, Hank and Dean Venture, naïve teenagers fumbling their way toward adulthood, sometimes aided by their overbearing super scientist father, Rusty, and reluctant bodyguard, Brock Samson, and sometimes waylaid by arch nemesis, The Monarch. Premiering in 2005 on Cartoon Network’s late night Adult Swim block, “The Venture Bros.” quickly left its 'Johnny Quest'-parody roots behind for funnier territory: a cast of characters divided by institutionalized good and evil, but united by questionable motives and sardonic wit. It’s precisely this balance of familiar and funny that’s key to fostering a rabid fan base: something for everyone to love. It’s safe to say that each character among the dozens that have been introduced throughout the show's four seasons has weaseled his or her way onto at least one fan’s Favorite list, regardless of screen time. In fact, the more obscure the character cosplayed, the more admiring nods garnered from fellow fans. At this year's San Diego Comic-Con, one fan attended the Venture Bros. panel dressed as a character that appeared in a background shot of only one episode. Every attendee in the room wished they had thought of something so fan-centric as the show creators, Jackson Publick and Doc Hammer, pointed him out to the crowd. Obscurity aside, the design of Venture Bros. characters allows an immense amount of flexibility for costuming. Some "Venture Bros." characters demand incredibly complex costumes that require an expert hand and weeks of assembly, while other character looks can be achieved by simply reaching into one’s own closet. For example, these expert cosplayers have fabricated numerous accessories, prosthetic applications and inventive plastic construction to become The Monarch and wife, while on the other hand, a guy could pull out a pair of jeans and sweater vest from a drawer and become Dean Venture. Difficulty level isn't the only factor of "Venture Bros." cosplay that's customizable: gender, size, shape and even the design of the costumes themselves are open to interpretation. The show's main baddie, The Monarch, has henchmen whose costumes require four things: the color black, the color yellow, wings and a butterfly mask. 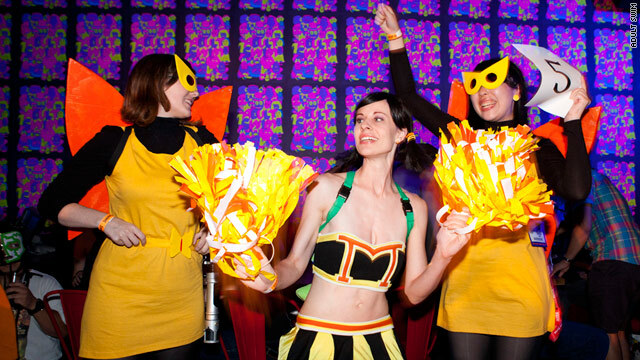 The fans depicted above decided that the henchmen are now henchwomen, and their fearless leader is also a cheerleader. In fact, the Monarch's henchman uniform has generated one of the rarities of cosplay: costuming en masse. Like the famous Star Wars storm trooper of the 501st, the nameless, faceless henchmen enjoy an instant camaraderie with strangers who are dressed exactly like they are. The order of the day becomes not safety in numbers, but power in numbers. Many conventions feature costume parades, and nothing makes a lasting impression like rows and rows of fake-gun-toting bad guys. Despite the identity-hiding masks, it’s easy to see how much fun these fans are having. Adding further to the fervor for "Venture Bros." cosplay are the consistent appearances of the show's creators at major conventions across the nation, and this year’s Dragon*Con is no exception. Veteran attendees of the con, Doc Hammer and Jackson Publick will be on hand again this year, along with voice of Dr. Venture and first-time Dragon*Con attendee, James Urbaniak, for a "Venture Bros." panel and general co-mingling with the masses. Cosplayers have the opportunity to approach them for the first, second or twelfth time in person to present the fruits of their labor and snap a photo. This luxury of getting up close and personal with the minds behind the mayhem is one afforded few costumers. However, it guarantees one thing: Facebook walls will overflow with pictures of ecstatic "Venture Bros." fans this Labor Day weekend. Love songs can be found in the histories and cultures of most societies, though their ubiquity is a modern phenomenon. A highly controversial and startling explanation of the genesis of love songs can be found in Denis de Rougemont's "Love in the Western World". De Rougemont's thesis is that love songs grew out of the courtly love songs of the troubadours, and that those songs represented a rejection of the historical Christian notion of love. -,,.. This isn't about a show so much as the cosplay associated with the show. Shouldn't you put this under "Otaku" which is supposed to be cosplay's official "home"? If this peice had anything to do with the actual Venture Bros. show, it would belong here. And yes, I watch and love the show.